Renacidin® (Citric Acid, Glucono delta-lactone, and Magnesium Carbonate) is a sterile, non-pyrogenic irrigation solution for use within the lower urinary tract in the dissolution of bladder calculi of the struvite or apatite variety, and prevention of encrustations of urethral catheters and cystostomy tubes. Renacidin's action on susceptible apatite calculi results from an exchange of magnesium from the irrigating solution for calcium contained in the stone matrix. The magnesium salts thereby formed are soluble in the gluconocitrate irrigating solution resulting in the dissolution of the calculus. Struvite calculi are composed mainly of magnesium ammonium phosphates which are solubilized by Renacidin due to its acidic pH. 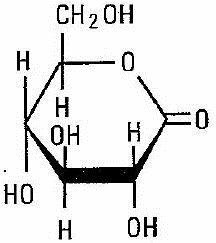 Renacidin is not effective for dissolution of calcium oxalate, uric acid or cysteine stones. Renacidin is indicated for dissolution of bladder calculi of the struvite or apatite variety by local intermittent irrigation through a urethral catheter or cystostomy tube as an alternative or adjunct to surgical procedures. Renacidin is also indicated for use as an intermittent irrigating solution to prevent encrustations of indwelling urethral catheters and cystostomy tubes. Renacidin is contraindicated in the presence of demonstrable urinary tract extravasation. Renacidin use should be stopped immediately if the patient develops fever, urinary tract infection, signs and symptoms consistent with urinary tract infection, or persistent flank pain. Irrigation should be stopped if elevated serum creatinine develops. The contents of individual Renacidin containers should not be combined for use as continuous irrigation of the urinary tract because of complications that may arise from inadequate aseptic technique. Terminal sterilization processes that are not adequate may result in sepsis and/or injury to product handlers (e.g., irritation to exposed, unprotected areas of the skin). Serious adverse reactions, including sepsis and hypermagnesemia, have been reported to occur when Renacidin was used for continuous irrigation of the upper urinary tract. Renacidin is not indicated for continuous irrigation of the upper urinary tract. Care must be taken during therapy with Renacidin to maintain the patency of the urethral catheter or cystostomy tube. Calculus fragments and debris may obstruct the catheter. Catheter outflow blockage may be prevented by flushing the catheter with saline and repositioning of the catheter. Frequent monitoring of the system should be performed by a nurse, an aide or any person with sufficient skills to be able to detect any problems with the patency of the catheter. At the first sign of obstruction, Renacidin should be discontinued. Patients with an indwelling urethral catheter or a cystostomy tube may have undiagnosed vesicoureteral reflux. Appropriate evaluation prior to initiation of Renacidin is recommended. If reflux is demonstrated, the potential benefits of therapy should outweigh the risks, and all recommended safety monitoring precautions should be strictly implemented. Patients should be monitored throughout the course of therapy with Renacidin. Serum creatinine, phosphate and magnesium should be obtained every several days. Urine specimens should be collected for culture and antibacterial sensitivity approximately every three days and at the first sign of fever. Therapy with Renacidin should be stopped if any culture exhibits growth and appropriate antibacterial therapy should be initiated. Therapy with Renacidin may be started again after a course of antibacterial therapy upon demonstration of sterile urine. Struvite calculi frequently contain bacteria within the stone and antibacterial therapy should therefore be continued throughout the course of dissolution therapy. An elevated serum creatinine concentration is also an indication to stop therapy with Renacidin. Concomitant use of Renacidin and medications containing magnesium may contribute to hypermagnesemia in susceptible individuals, such as patients with vesicoureteral reflux. Renacidin Irrigation should be used with caution in patients taking concomitant medications containing magnesium. Long term studies to evaluate carcinogenic potential of Renacidin in animals have not been conducted. Mutagenicity studies have not been conducted. Animal reproduction studies have not been conducted with Renacidin. It is also not known whether Renacidin can cause fetal harm when administered to a pregnant woman or can affect reproduction capacity. Renacidin should be given to a pregnant woman only if clearly needed. Magnesium is known to be excreted into human milk. It is not known whether Renacidin is excreted in human milk. Because many drugs are excreted in human milk, caution should be exercised when Renacidin is administered to a nursing woman. The most common adverse reactions with use of Renacidin for dissolution of bladder calculi or prevention of encrustations of indwelling urethral catheters are “bladder irritability” and chemical cystitis, both reported to occur in approximately 3% of patients. A transient burning sensation in the bladder following Renacidin has been reported to occur in less than 1% of patients receiving Renacidin. Renacidin for local irrigation within the lower urinary tract is available in single-use 30 mL containers. Step 1: Inspect Renacidin visually for particulate matter and discoloration prior to administration. If particulate matter or discoloration are observed, do not administer. Step 2: Remove the plastic tab connected to the conical tip of the Renacidin container by twisting the plastic tab. See Figure 1. 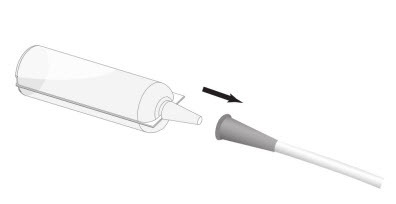 Step 3: Connect the conical tip of the Renacidin container to the end of the urethral catheter or cystostomy tube. See Figure 2. Step 4: Squeeze the Renacidin container to expel the entire contents into the urethral catheter or cystostomy tube. See Figure 3. For Dissolution of Bladder Calculi: Instill 30 mL (one container) of Renacidin into the bladder via a urethral catheter or cystostomy tube. 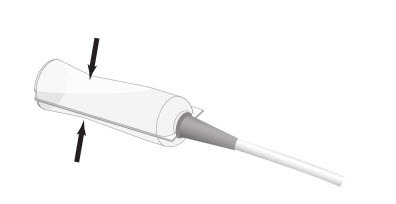 Clamp the urethral catheter or cystostomy tube for 30 to 60 minutes. Release the clamp and drain the bladder. Repeat the instillation procedure 4 to 6 times a day. Monitor for dissolution of calculi. For Prevention of Encrustations in Urethral Catheters and Cystostomy Tubes: Instill 30 mL (one container) of Renacidin into the urethral catheter or cystostomy tube. Clamp the urethral catheter or cystostomy tube for 10 minutes. Remove the clamp and drain the bladder. Repeat the instillation procedure 3 times a day. Renacidin is available as a sterile, non-pyrogenic irrigation solution in 30 mL single-use, low density, polyethylene containers, supplied in boxes of 30 containers each. Exposure of Renacidin to heat or cold should be minimized. Renacidin should be stored at room temperature, 59° to 86°F (15° to 30°C). Avoid excessive heat or cold (keep from freezing). Brief exposure to temperatures of up to 40°C or temperatures down to 5°C does not adversely affect the product. Read accompanying package insert for complete instructions on use. seal is intact, there is no leakage evident and solution is clear.